Unquestionably, one of the most memorable quotes from a street battle ever, its’ a line that was shortly followed up by a sucker punch to Nyckz' left cheek from rap opponent "EnJ". Although the line was clearly hilarious and could be deemed as somewhat insulting, was that the real reason EnJ decided to suckerpunch Nyckz during their battle? Gun references throughout the lyrical bout are cited as the main reason, but they (gun references) are so common in battles nowadays that it is almost expected. My opinion: EnJ was mad that Nyckz was stylin' on him. That is a prime example of how the game has changed so much, Fashion has become the 5th element of hip-hop. Although, I received an email last year stating that there are now over a dozen elements, I am still unfamiliar with the sender and I will have to verify the "New" 8 elements another day. Why fashion though? In 2007, MCs are hard to come by, but rappers? You can find one on every block, in every crew, from every background and situation. I am not going to turn KRS(-ONE) on y’all, but one difference in the modern day rapper is that lyrical content is dull and a lot of them need to rely on swag (Fashion) for an upper hand. As an 80's baby, I always relied on my abilities and hustle to get me where Im going, but with the state of music & culture the way it is, I've been forced to change things up a little. Lets take a short stroll down memory lane, to the late 70's & early 80's. 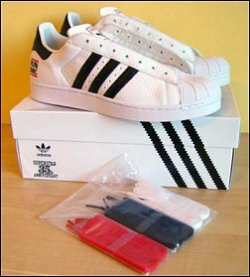 Adidas Superstars ("Shelltoes"), suede Puma's, Levi's jeans & Cazal glasses ran the newly developed hip-hop fashion scene. As stated earlier, I do not have any recollection of the 70's (as I was not born yet) and to be honest, I was not alive for a couple years in the 80's either. One thing is for certain, fashion was a lot more simple 35 years ago than it is today. With a simple change of the colour of your shoelaces, yesterday's plain outfit can be turned into today's most stylish and unique look. When a simple cuff in your jeans could diversify your whole look and immediately separate you from other kids on your block. The good ol' days? Maybe. Is it hard to believe that we are only three short years away from 2010? Does anyone else remember when television & movies would have robots and machines running the universe and the year would be 2010? Well, today's fashion is yesterday's fashion with a few minor changes. For much of the last seven years, the urban fashion scene has been dominated by retro looks and throwbacks from yesteryear. Whether it was the Air Force 1 sneaker that originally came out in the early 80's or the "dookie" chain from the late 80's, the interest in "new" is just not what it was. Ever wonder why teenagers/young 20's dress in clothes that were popular years before they were born? Well, me too.